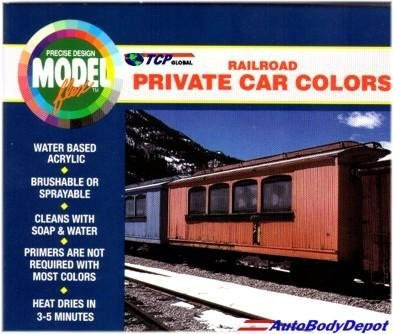 Modelflex RR private car colors: Cabose Red, Rail Box Yellow, Mo Pac Blue, Pullman Green, Super Gloss Black, Santa-Fe Silver, Maroon Tuscon Oxide Red. Paint for the professional modeler. If you’re not satisfied until every detail is perfect,then let MODELflex bring your models to life. It is a superior hobby paint designed to help modelers achieve authentic,professional painting results,with greater ease and proficiency. Waterbased MODELflex is easy to apply with an airbrush or paint brush and clean-up is fast and easy with MODELflex cleaner.MODELflex paint dries in 12 to 15 minutes at room temperature (3 to 5 minutes if heat dried).With 120 authentic colors to choose from,MODELflex has you covered no matter what you model. Superior adhesion to most plastics,resins,metals and various other substrates. Liquid Decal Film allows you to create your own decals by brushing it on a flat clean surface. Allow to dry and draw or paint on your image.